As the entry level model on the industrial range, it punches well above its weight providing not only superb dry steam output, but continuous refill and external detergent facility. 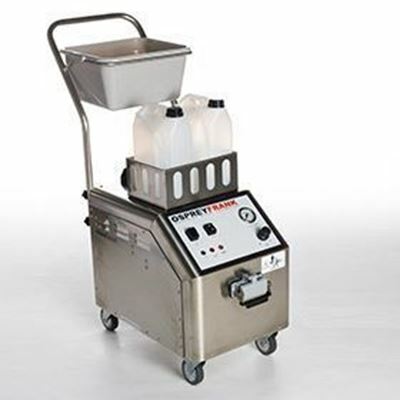 The steam volume can be easily regulated for the task in hand whilst the easy access of the detergent bottles, allows for total flexibility and quick changes as required for different jobs and applications. Sharing the same robust and distinctive stainless steel body as the more powerful models in the range, is ideally suited to cleaning professionals, offering the usual steam benefits and representing excellent value for money. Excellent for gum removal, and many other cleaning tasks in the catering and leisure industries, hospitals and nursing homes, even car showrooms and workshops.